Link Spell Card is a type of Spell Card existing only in the Yu-Gi-Oh! VRAINS anime. They possess Link Arrows, similarly to Link Monsters, and remain on the field once activated. A Link Spell Card can be activated only in a Spell & Trap Zone a Link Monster points to, similar to how an Extra Deck monster must be Special Summoned to the Extra Monster Zone, or to a Main Monster Zone a Link Monster points to. 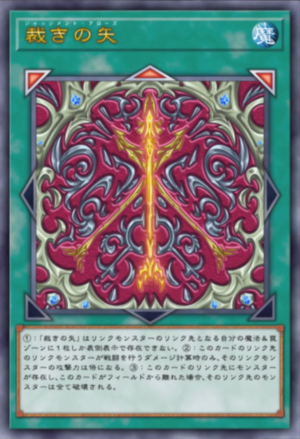 The Link Arrows appear to function in the same way as the ones that Link Monsters have, enabling certain effects when it points to a card, and allowing monsters to be Special Summoned from the Extra Deck to the zones it points to. However, they can only be activated to a Spell & Trap Zone that is pointed by an existing Link Monster. Currently, the only known Link Spell is "Judgment Arrows". ↑ Yu-Gi-Oh! VRAINS episode 79: "Speed of Light - Lightning"